"I am just grateful that people are finding this as an outlet to be able to say that this happened to them. As a way of walking through and finding some semblance of healing in it or using it as their very first outcry. There are people who have reached out to me who have never told anyone else……There is a true feeling of empowerment in doing this. It’s been so cathartic for me. Whether you are a survivor or not the one thing that I hope will happen is that it will make people talk." 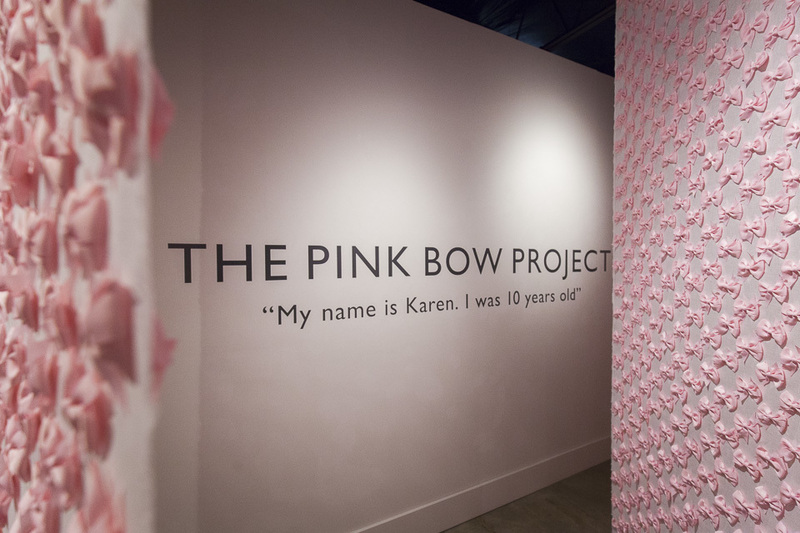 The Pink Bow Project is an installation at Gallery Shoal Creek in Austin, Texas from April 13th to May 12th, 2018. 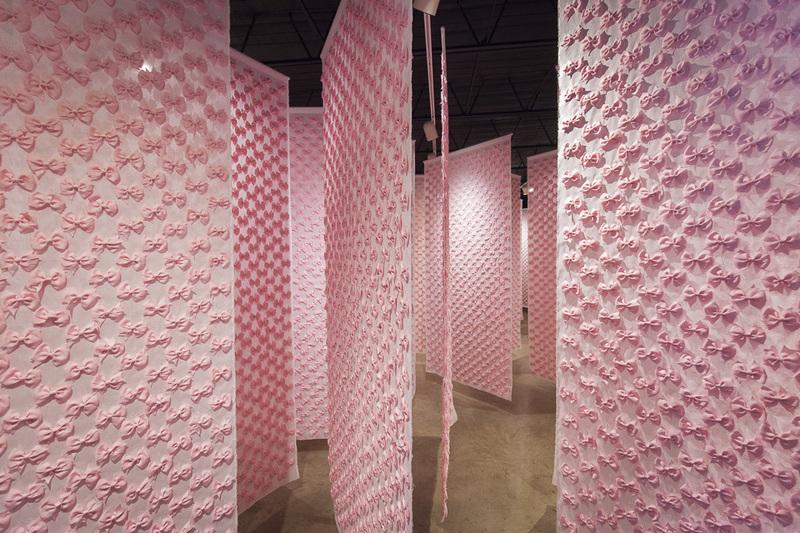 Fifty two panels each with 1000 bows to approximately represent the substantiated cases of sexual abuse of females under the age of 18 each year in the US. The problem with that reported number is that it is likely very low when considering all of the factors that go into and work against each case first being shared, then believed, and lastly officially proven. Every aspect of the installation has meaning and at first the beauty of it is disarming and it’s easy to be drawn in. 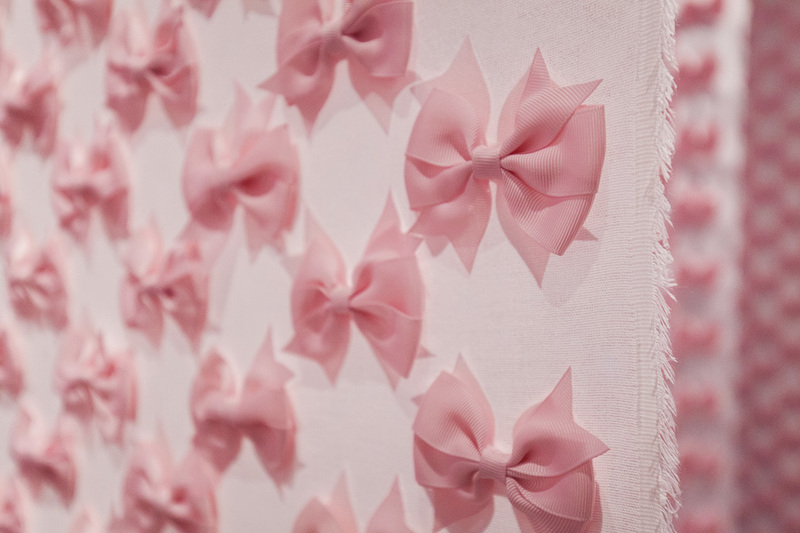 But once in the middle of the panels you might feel constricted and unable to connect with others you see just on the other side of thousands of innocent pink bows. All of this and more is intended to communicate some of the feelings Karen Hawkins has had as an artist and survivor of sexual abuse. Karen created the project to open up more conversations about sexual abuse, to help educate people, to create the opportunity for healing, and bear witness to those who are the victims of that abuse. It originated out of a space where she was really struggling to see how she fit in the world, was looking for more purpose, and also a desire to be a part of the national discourse about abuse. How could she add to the collective empowerment of the movement and keep it going it forward? Karen decided to use her story, creative energy, and voice, along with those of other women, in a potentially influential way to help bring this issue out of the shadows. If others can be vulnerable and come forward then so can she. Karen started to explore being an artist later in life out of the necessity to stay sane once she had raised her children. She found sculpture very fulfilling as she moved towards expressing her creative side in a less domestic way. Art satisfied her soul and helped with anxiety and depression which dissipated the more she was creative and worked with her hands. But early on she still found it hard to own that she was an artist even though she was creating in a more powerful way along with journaling and therapy to help process her past traumas and struggles. After many years of hard work and with the help of many loving and supportive people that changed. A lot of her art is based on books, which she has been enamored with since childhood. As an adult she still very much loves the form of the book, the feel of the paper, the smell of its history, and imagines the life it led and who possessed it. The process of turning a book into an object and manipulating its form for her is a repetitive, healing, and zen like practice and movement. It is the entire process she goes through that is the most satisfying, not just the final product. Her work is visually engaging and often has meaning beyond its atheistic form as is of course the case with The Pink Bow Project. What a powerful and moving conversation this was for me. Karen’s vulnerability is so impressive and the fact that she created such an important installation to address a severely under-appreciated issue is commendable. The first half of the interview we speak about her art career and life and the second half we dig into the details of The Pink Bow Project. If you find this interview valuable please share it and further Karen’s mission to help educate and hopefully try to heal and prevent this all too common abuse perpetrated upon the women of the world. As she says in the interview we can no longer accept the status quo.